Firstly, before we get properly started, a quick update on a story hinted at on yesterday’s Mundane Monday post regarding The Renovator’s Christmas bus trip: he arrived home in a relatively sober state having had what he pronounced a pleasant evening in which he partook of a wide variety of enjoyable food and a bevvy or two. In other words, not a hugely newsworthy story. Never mind that, though, as the other prospective blog fodder did pan out. The Farmer’s bedroom has advanced to stage two as this morning the Pop mobile appeared in the Homestead driveway with Uncle Trevor riding shotgun. The Farmer’s bedroom makeover was always going to be a big operation as it involved removing a fireplace, creating a new room entrance and changing part of the original room into a walk in store cupboard; ie: stuff none of us here on the Homestead could even begin to contemplate undertaking It’s true that, as various projects around the Homestead have been tackled in the six or so years of our residence, our collective DIY skills have advanced astoundingly, but some jobs still fall squarely onto the shoulders of the Pop/U.T. dynamic duo. At the end of the day, we’d be utterly foolish to argue with the double- lifetime building experience of these two gents. Melody, number one cat, on hearing of Dave’s blog appearance yesterday, insisted on appearing in today’s photo. 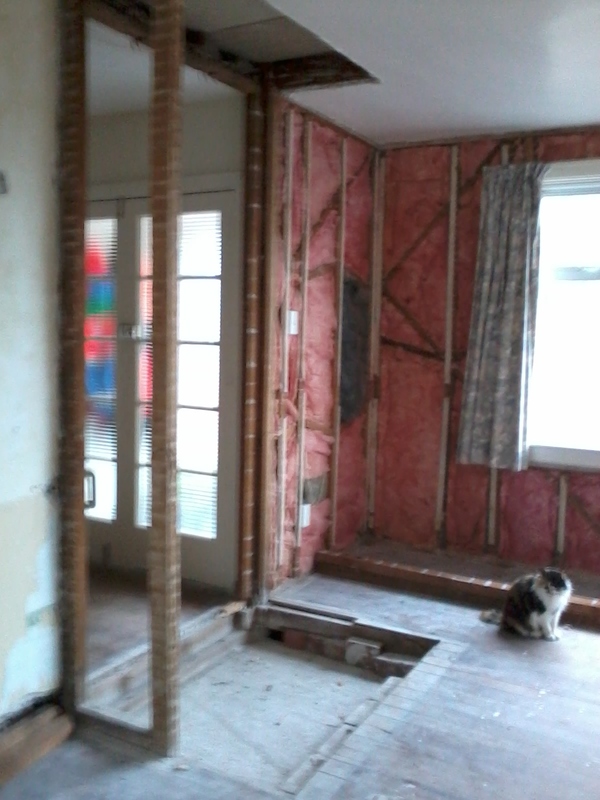 Here she is surveying the remains of the fireplace which is to become the new entrance to The Farmer’s bedroom. The salvaged rimu floorboards are in place, the chimney hole is framed up and work has begun on turning a gaping hole into a doorway. Mel has also lost interest in any further photo opportunities…and our inner front door apparently got in the way. Word is they’ll be back on the Homestead again on Thursday to “kick the job along”. We’ll keep you posted. 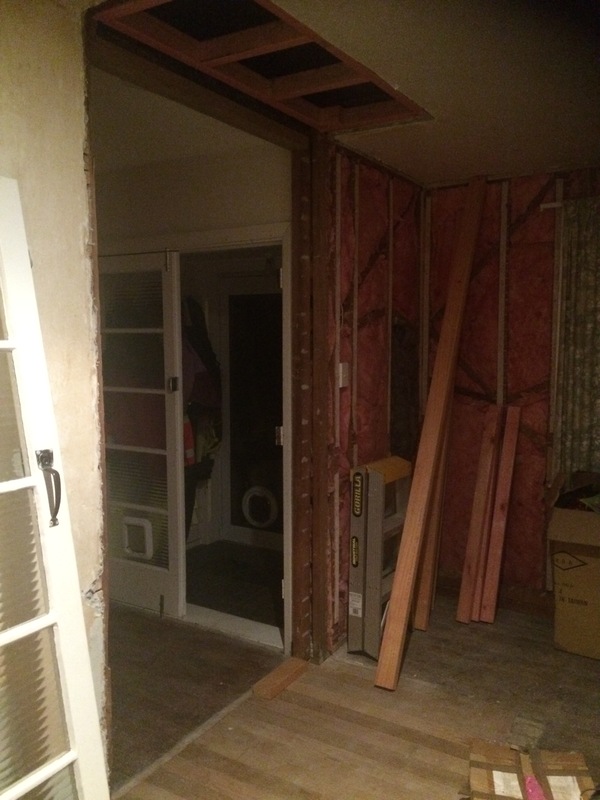 This entry was posted in Union Homestead and tagged builder, builders, building, cat, NaBloPoMo, renovate, renovations. Bookmark the permalink. Holy mackerel..as they say here: Pop and UT sure know their business ! Ps I do hope you finish that goat trampoline one day and I so happy to wake up with the image of jumping goats on a trampoline!!! That looks like a great start. How lucky you are to have wooden buildings which can be converted so much more easily than our brick and stone. I’m very happy with the progress as all of us, especially The Farmer, are a little sick of him sleeping in the living room. When we made a list of requirements for our new abode, very near the top of it was “permanent materials” – brick or the like. Thank goodness we ended up in a ramshackle wooden place as tend to be much more forgiving when the earth moves. Wow. The dynamic duo really made big progress for one day’s work. And they work for darjeeling at regular intervals? I can do that…send them on up when they’re done with that bedroom, there’s this barn, you see…I’ll even throw in cookies. I’m glad Melody deigned to appear for a cameo, and she looks suitably aloof too, such a proper cat..
Poor old Farmer must be bunking in with someone else for the duration, but it will be lovely when it’s done, and well worth the inconvenience, I’m sure. When I was 8, and we first moved here, my bedroom was the only access to the bathroom – anyone wanting the facilities had to go through my room. My half of the room was separated from the rest of the space with a large dresser, with my bed tucked behind it, so that I wasn’t bothered by the light from the opening door, and the other door, and I got used to people traipsing through at all hours. It took a couple of years (no dynamic duo) to get a room built for me in the attic, but it was eventually done, and it was lovely. Still is – it’s the 16 yr old’s room now. I’ll put the barn job to them, but they’re both in pretty high demand here right now. 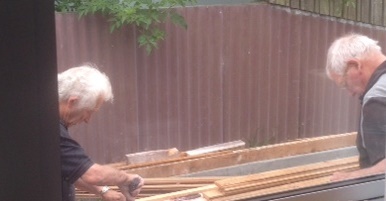 Builders are like gold dust and builders of the grey haired variety even more so. The Farmer is currently sleeping in the living room. It’s one of those things that initially is kind cool – it’s in close proximity to the woodburner, you can watch TV (yes, we are one of those relic families that only has one TV) from bed, you’re at the centre of everything…but you do get a bit over not having your own space. How awesome to be in the same space you were when you were 8! Being in the same place I grew up in is a mixed blessing, and poor hubby comes up against “it’s always been like that” far too often for his liking. Builders coming back in the same week? Incredible. I’ll believe it when it happens.